Yasuko’s story collection Floating Like the Dead was published by McClelland & Stewart in 2012 and was shortlisted for the Danuta Gleed Award and the B.C. Book Prize for Fiction. One story in it won an Arthur Ellis Award for Best Crime Short Story. The title story won the Journey Prize for the best story published in Canada in 2009. Quill and Quire named Floating like the Dead a best book of the year. CBC hailed Yasuko Thanh one of ten writers to watch in 2013. Mysterious Fragrance of the Yellow Mountains is her debut novel inspired by the history of her father’s family in French Indochina. Yasuko lives in Victoria, B.C., with her two children. “Yasuko Thanh’s new memoir Mistakes to Run With lands with jarring force…. The book’s honesty is relentless, and its spirit of survival defies platitudes. 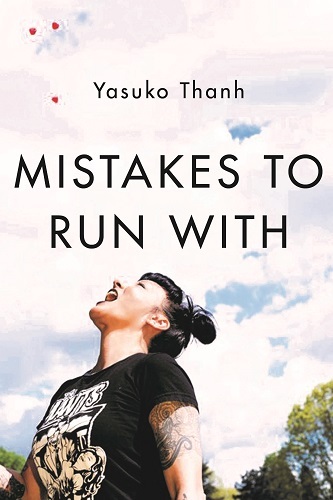 In her memoir, Mistakes to Run With, Yasuko Thanh, author of the award-winning novel Mysterious Fragrance of Yellow Mountains, reflects on her journey from a runaway and prostitute to a successful writer. In 1998, when she realized she was pregnant with her first child, Yasuko began to examine her past and consider what she wanted her future to be like. Yasuko had lived on the street since the age of fifteen, and her life included prostitution, arrests, drugs, an abusive relationship, and struggles with mental health. What would she tell her child about the kind of person she was? How could she move forward as a writer, or as a student wanting to continue her studies, with only a Grade Nine education? With remarkable insightfulness and candor, Yasuko Thanh deconstructs a past filled with harrowing troubles and inspiring triumphs to discover the path that led her to become an award-winning author. Mistakes to Run With explores the links between memory, identity, and art while asking important questions such as: Under what circumstances would someone disobey the law? In what ways do we sacrifice our freedoms in exchange for economic advantages? Can we truly love the people who hurt us? Mistakes to Run With an Indigo pick for the month of April 2019!